This area has something for everyone. You could take your stock fourby along the main tracks with no difficulty or you could take your Comp truck and have a ball. This run is a moderate rating. 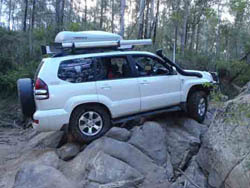 Reasonable clearance vehicles with off road tyres preferably. In the wet there are some good creek runs with good firm bases. Make sure you have a snorkel.